Topsail Island (pronounced the 18th Century English way: "Tops'l") got its name when Seafarers during the era of the infamous pirate Edward Teach (Blackbeard) noted that the pirate ships lurking under cover in the sounds and inlets behind the island couldn't completely hide themselves - the topsails of their ships poked up above the dunes and gave them away. So the island's name was short-hand for some good advice: If you spy a topsail behind this stretch of coast, either get away in a hurry or prepare for a confrontation. 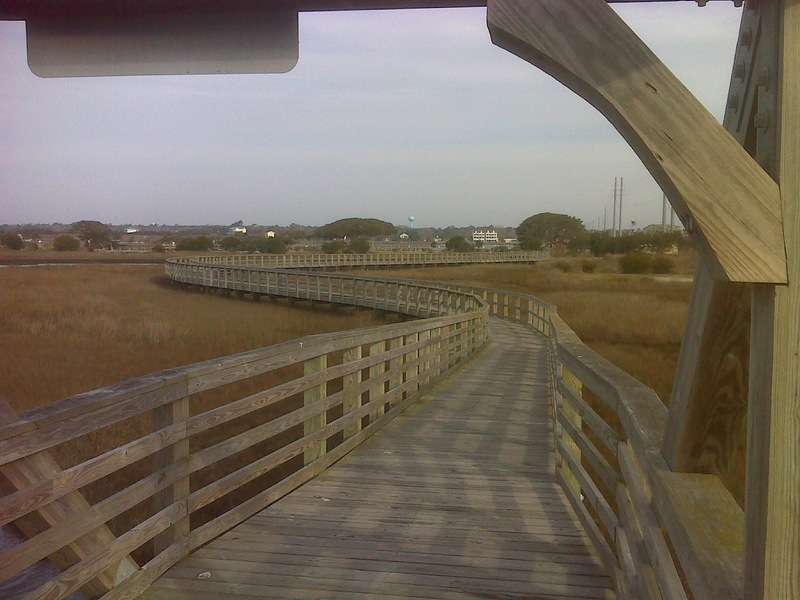 Topsail Island is also known for its sea turtle hospital. 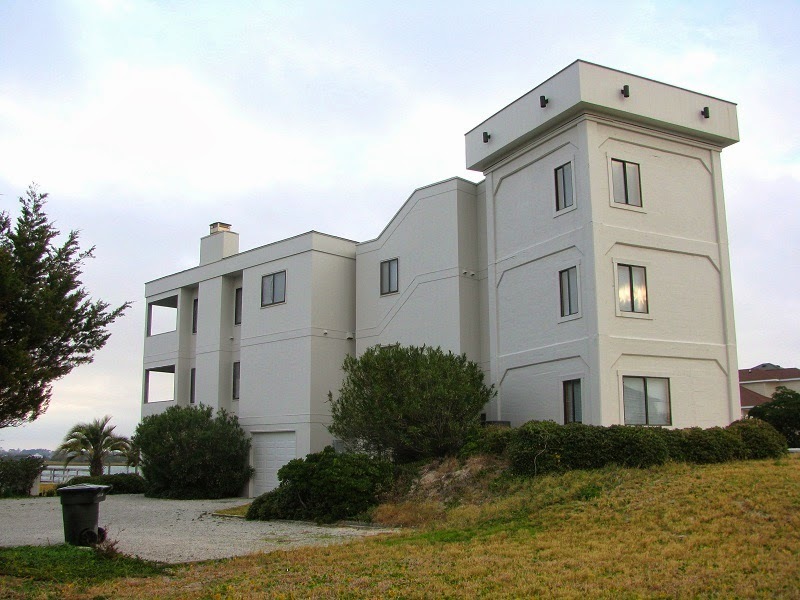 The brand new expanded facility at 302 Tortuga Lane, Surf City, is just opening this spring. It is 200 yards from the MST on Cedar Avenue, so I'm hoping that a footpath leading to it can be built. Finally, another new facility of note to MST hikers has just opened just two miles from the Island and right on the MST route. 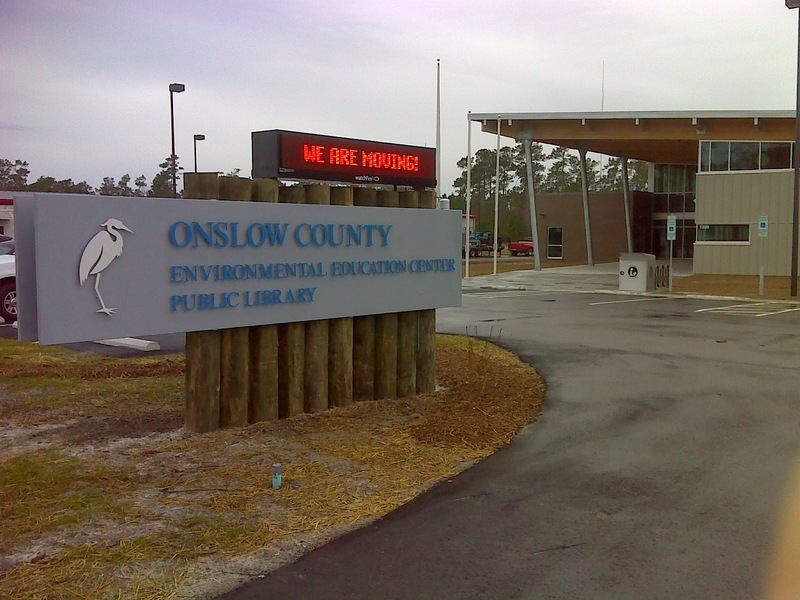 It's the Onslow County branch public library and Environmental Education Center. It has a loop trail that I'm hoping can be extended to become part of the MST. Meanwhile the facility, which just opened this week has two dozen or more new computers for public use with internet access, wi-fi, and a spacious facility (open during regular business hours). 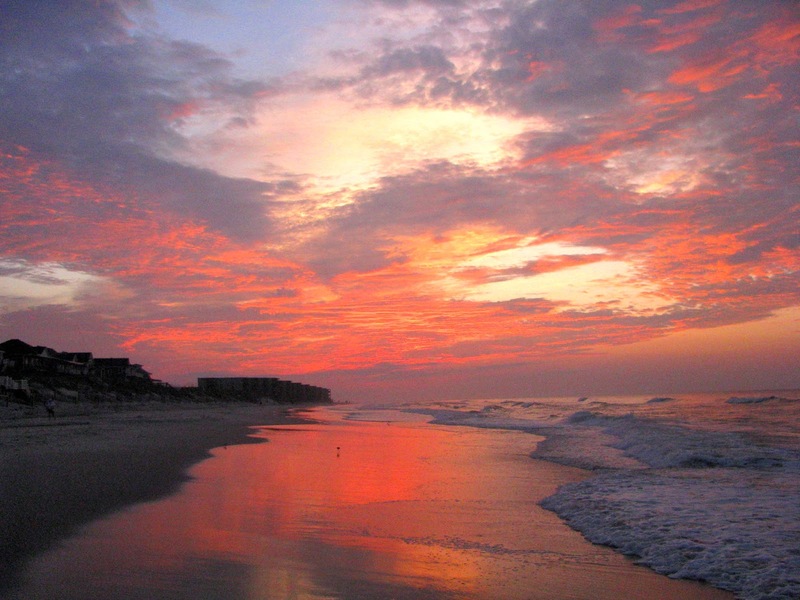 Another highlight of hiking Topsail Island's beaches are the abundant sharks teeth that the sharp-eyed hiker will find. 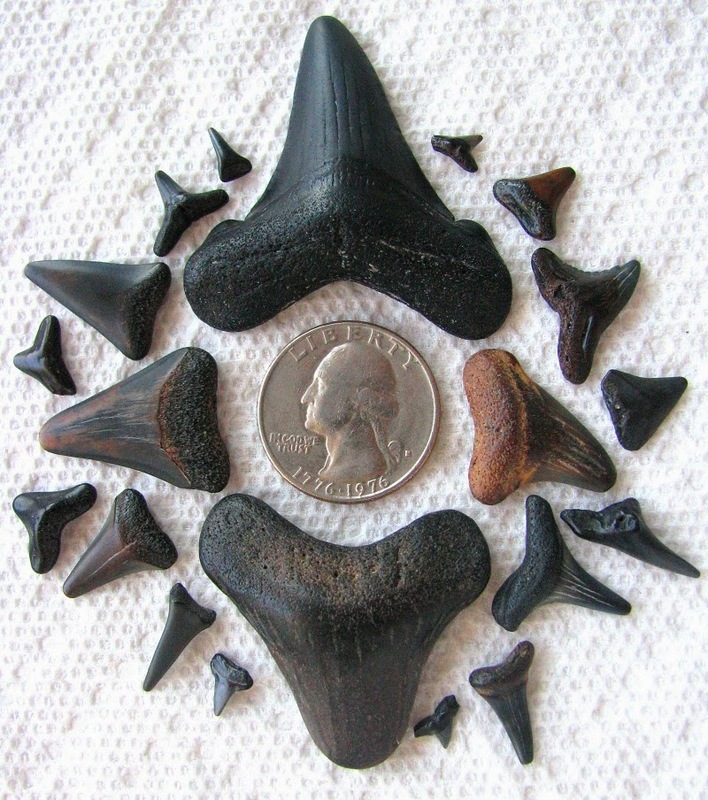 These are actually fossil teeth (the fossilization process turns them black, whereas modern sharks teeth are white). If you're lucky you'll find one of the huge ones--from an extinct giant shark called the megalodon that reached as much as sixty feet in length and had individual teeth as large as 7 inches. 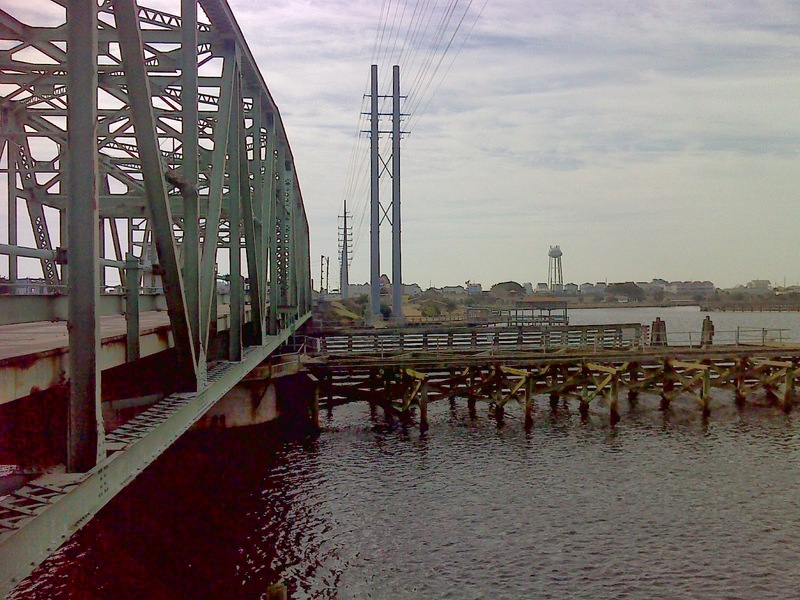 And then a crossing of the historic Swingbridge, slated to be replaced within this decade. And reaching the entrance to the massive Holly Shelter Game Land. Look for the report of my Holly Shelter hike next. "The sky was clearing and the wind, as said, had gone nearly calm. It was one of the rare days in spring when the weather inland, away from the influence of the cold water, was not significantly warmer than on the beach (because of the cloud cover to that point and because of the NW breeze). So I was thoroughly enjoying this walk. The day seemed perfect. Then, very suddenly, everything turned upside down. 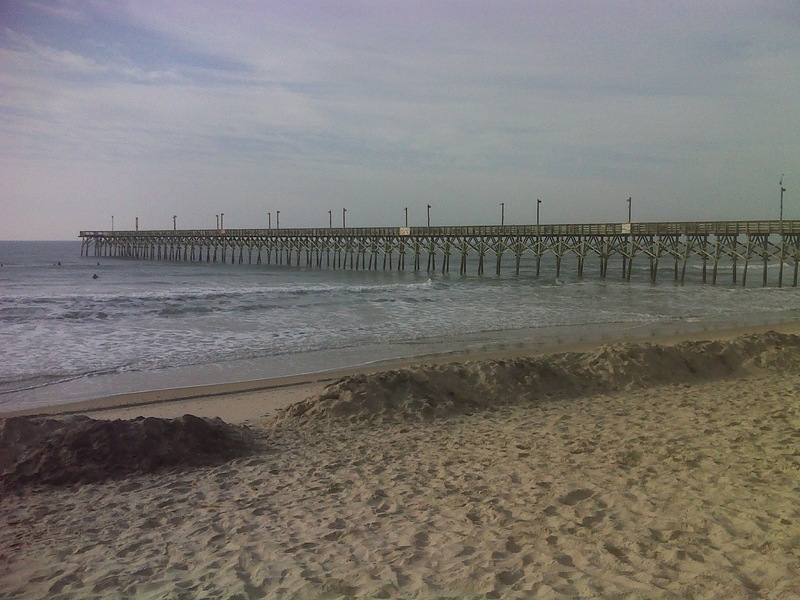 I was nearing the Project Bumblebee tower intending to take some art shots of the birds that always sit out on the remnants of the old fishing pier there, but I was noticing someone in a white shirt who seemed to be sitting in the shallow surf just in front of the pier pilings as I viewed them. That seemed really peculiar since the water was very chilly—low 50’s—and the air temperature wasn’t much warmer. As I approached a woman in a black coat had gone out and seemed to be talking to the person in the white shirt. Then two young guys came running up the beach past me and came up to the other two. The woman seemed to be shouting. I was getting pretty close when a vehicle pulled up beside them on the beach, having come from the other way. Out jumped three men all in black, and the next thing I noticed was that all these people were dragging an unconscious person up out of the surf. "It turns out that the man in the white shirt, whose name is Wes, had known the accident victim for years. Both are surfers. Wes had talked with the man while he was surfing about an hour before, and then left. When he returned, about twenty minutes before the photo, he found the victim floating in the surf, called 911, and began to administer CPR right there in the shallow surf—that’s what I was seeing from a distance. Anyhow, three more emergency vehicles soon arrived and a team of about a dozen paramedics started the victim on IV’s, constantly kept pumping his heart by hand, and pumping oxygen into his mouth using a big bulb apparatus. But the victim wasn’t responding, and eventually they gave him up for dead. Wes had left by then, apparently to try to make contact with the victim’s family—had said his name was Michael Moore of Snead’s Ferry, and one of the responders knew him and told me later that he died doing what he loved most, which consoled me a bit because I was really shaken up by this—don’t think I’ve ever witnessed a person dying/newly dead before. Here's a link to the news release. "The four vehicles drove off with the body and suddenly there wasn’t even a trace of the event. It seemed so surreal. Suddenly my hike just didn’t seem to matter—in fact it almost felt blasphemous to be just strolling up the beach picking up sharks teeth and taking pictures of birds on old pier pilings. “Everybody dies” were the words that came to my mind at that point. But that didn’t seem comforting—it seemed morbid, depressing. Well, I gradually got my balance back—life indeed goes on, as does my hike. Yet I can’t help making a comparison to the tragedies on the AT, particularly the one that also involved water—Paul ‘Parkside’ Bernhardt. 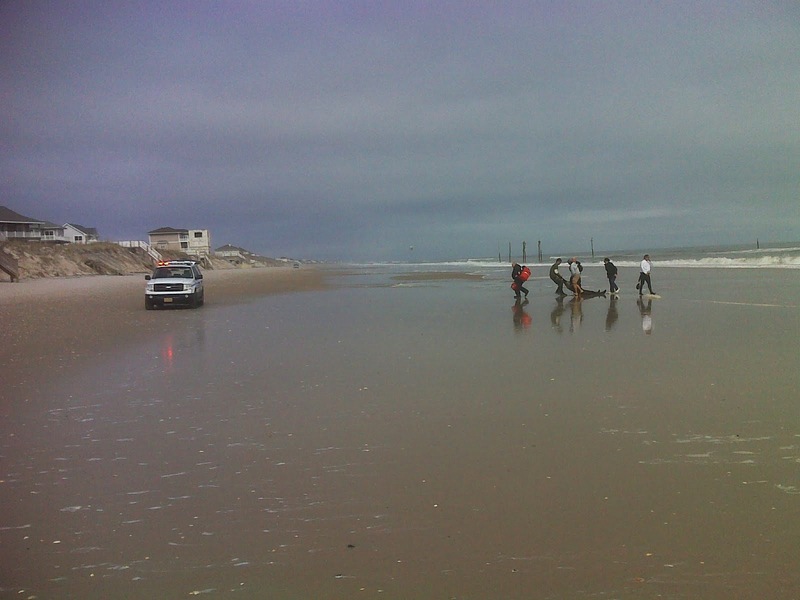 I’ve walked Topsail Island’s beaches hundreds of times and yet it was when I was ‘officially’ hiking the MST that this tragedy happened before my eyes." That's the end of the emotional quote from my personal journal. Life indeed does go on, and I'm sure that Michael, whom all his friends knew as 'Fish', would say - "Go for it - keep following your passion, and hope when your end comes, you're in the moment and loving it." And so I hike on, and I'm indeed loving it. 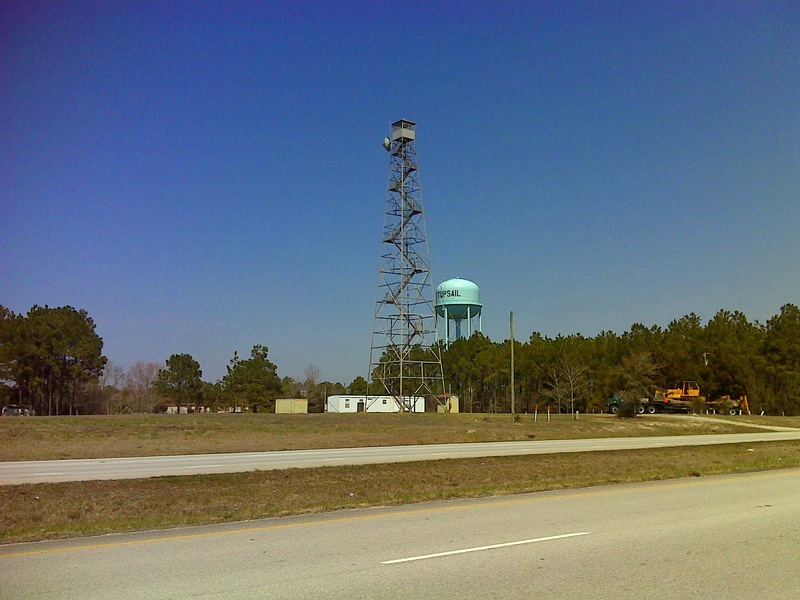 Here are the GPS tracks for the two days of hiking to, on, and from Topsail Island, with many more photos available in the slide show.